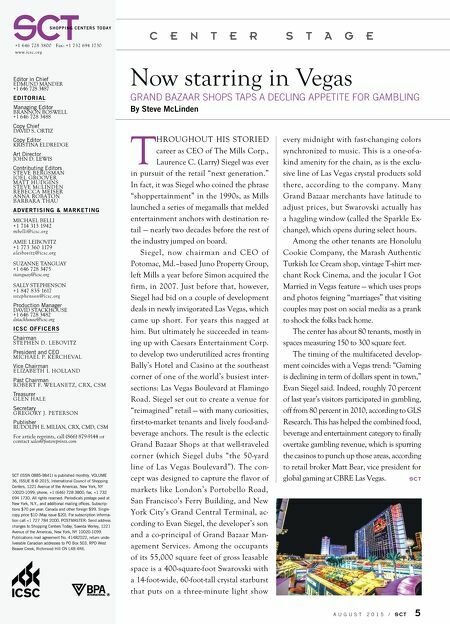 A u g u s t 2 0 1 5 / S C T 5 C E N T E R S T A G E Now starring in Vegas grAnd BAzAAr shops tAps A decling Appetite for gAmBling By Steve McLinden T hroughouT his sToried career as Ceo of The Mills Corp., Laurence C. (Larry) siegel was ever in pursuit of the retail "next generation." 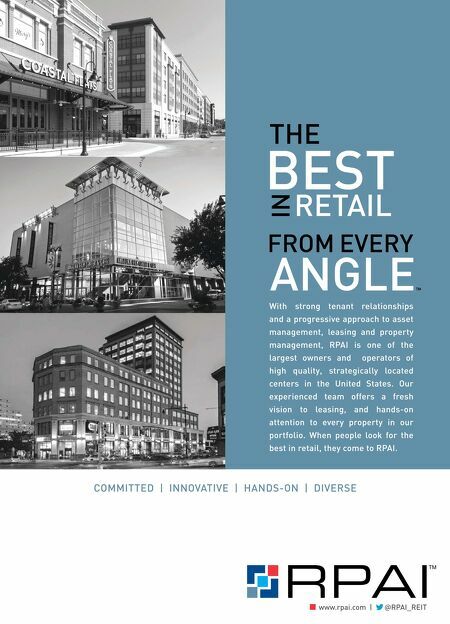 in fact, it was siegel who coined the phrase "shoppertainment" in the 1990s, as Mills launched a series of megamalls that melded entertainment anchors with destination re- tail — nearly two decades before the rest of the industry jumped on board. siegel, now chairman and Ceo of Potomac, Md.–based Juno Property group, left Mills a year before simon acquired the firm, in 2007. Just before that, however, siegel had bid on a couple of development deals in newly invigorated Las Vegas, which came up short. For years this nagged at him. But ultimately he succeeded in team- ing up with Caesars entertainment Corp. to develop two underutilized acres fronting Bally's hotel and Casino at the southeast corner of one of the world's busiest inter- sections: Las Vegas Boulevard at Flamingo road. siegel set out to create a venue for "reimagined" retail — with many curiosities, first-to-market tenants and lively food-and- beverage anchors. The result is the eclectic grand Bazaar shops at that well-traveled corner (which siegel dubs "the 50-yard line of Las Vegas Boulevard"). The con- cept was designed to capture the flavor of markets like London's Portobello road, san Francisco's Ferry Building, and New York City's grand Central Terminal, ac- cording to evan siegel, the developer's son and a co-principal of grand Bazaar Man- agement services. Among the occupants of its 55,000 square feet of gross leasable space is a 400-square-foot swarovski with a 14-foot-wide, 60-foot-tall crystal starburst that puts on a three-minute light show every midnight with fast-changing colors synchronized to music. This is a one-of-a- kind amenity for the chain, as is the exclu- sive line of Las Vegas crystal products sold there, according to the company. Many grand Bazaar merchants have latitude to adjust prices, but swarovski actually has a haggling window (called the sparkle ex- change), which opens during select hours. Among the other tenants are honolulu Cookie Company, the Marash Authentic Turkish ice Cream shop, vintage T-shirt mer- chant rock Cinema, and the jocular i got Married in Vegas feature — which uses props and photos feigning "marriages" that visiting couples may post on social media as a prank to shock the folks back home. The center has about 80 tenants, mostly in spaces measuring 150 to 300 square feet. The timing of the multifaceted develop- ment coincides with a Vegas trend: "gaming is declining in term of dollars spent in town," evan siegel said. indeed, roughly 70 percent of last year's visitors participated in gambling, off from 80 percent in 2010, according to gLs research. This has helped the combined food, beverage and entertainment category to finally overtake gambling revenue, which is spurring the casinos to punch up those areas, according to retail broker Matt Bear, vice president for global gaming at CBre Las Vegas. S C T +1 646 728 3800 Fax: +1 732 694 1730 www.icsc.org Editor in Chief edMuNd MANder +1 646 728 3487 E D I T O R I A L Managing Editor BrANNoN BosWeLL +1 646 728 3488 Copy Chief dAVid s. orTiZ Copy Editor KrisTiNA eLdredge Art Director JohN d. LeWis Contributing Editors sTeVe BergsMAN JoeL grooVer MATT hudgiNs sTeVe M c LiNdeN reBeCCA Meiser ANNA roBAToN BArBArA ThAu A D V E R MiChAeL BeLLi +1 714 313 1942 mbelli@icsc.org AMie LeiBoViTZ +1 773 360 1179 aleibovitz@icsc.org suZANNe TANguAY +1 646 728 3475 stanguay@icsc.org sALLY sTePheNsoN +1 847 835 1617 sstephenson@icsc.org Production Manager dAVid sTACKhouse +1 646 728 3482 dstackhouse@icsc.org I C S C O F F I C E R S Chair man sTePheN d. LeBoViTZ President and CEO MiChAeL P. KerCheVAL Vice Chairman eLiZABeTh i. hoLLANd Past Chairman roBerT F. WeLANeTZ, CrX, CsM Treasurer gLeN hALe Secretary gregorY J. PeTersoN Publisher rudoLPh e. MiLiAN, CrX, CMd, CsM For article reprints, call (866) 879-9144 or contact sales@fostereprints.com S H O P P I N G C E N T E R S T O D A Y SCT (ISSN 0885-9841) is pub lished monthly. VOLUME 36, ISSUE 8 © 2015, International Coun cil of Shop ping Cen ters, 1221 Avenue of the Americas, New York, NY 10020-1099; phone, +1 (646) 728 3800; fax, +1 732 694 1730. All rights reserved. Periodicals postage paid at New York, N.Y., and ad di tion al mailing offces. Sub scrip- tions $70 per year; Canada and other foreign $99. Single- copy price $10 (May issue $20). For subscription informa- tion call +1 727 784 2000. POST MAS TER: Send address changes to Shopping Cen ters Today, Sawida Worley, 1221 Avenue of the Americas, New York, NY 10020-1099. Publications mail agreement No. 41482022, return unde- liverable Canadian addresses to PO Box 503, RPO West Beaver Creek, Richmond Hill ON L4B 4R6.